Tracy Lucht has painted a portrait of Sylvia Porter with precision and clarity. 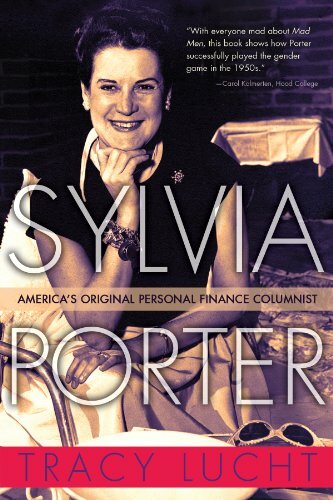 For anyone younger than 30, the name Sylvia Porter may have little or no meaning, but for those who grew up in the 1940s through the 1970s, hers is a name that brings memories of learning about finance and how to handle its many nooks and crannies. In Lucht’s book, Porter is portrayed on the one hand as a complex person, but on the other as a woman who saw herself in simpler terms, yet still expected to succeed; one who never saw failure as part of her life’s work. The book is completed in a simple five chapters and yet gets into this woman’s life and her beliefs in detail. For women, Sylvia Porter brought feminism to another level. Ms. Porter insisted that women should take control of their financial and professional lives; that they should not acquiesce to earning less than men for doing the same work; that they should strive to pursue a career; and yet within her own marriage she believed that women had a role to play that was different than men’s. It was during the war years of the 1940s and beyond that Ms. Porter’s columns became more active with her plain common sense approach; her “second person” viewpoint; and her use of “superlative statistics.” At the beginning of her career, Ms. Porter wrote her own columns following this approach. As her fame grew, and along with it many more and expansive responsibilities, Ms. Porter found it necessary to outsource work to ghost writers. Although she would read their columns to ensure their writing spoke to her style, it was clear that she would remain the boss, frequently not giving credit to her writers for their work. Politically, Ms. Porter’s liberal leanings drew toward supporting the middle class American through education and political programs. Although liberal in her beliefs, she accepted roles in the political arenas of both Republican and Democratic presidents, and assisted in advising and establishing programs in the administrations of both President Gerald Ford and President Lyndon B. Johnson. This chapter details the WIN campaign and the Citizens Action Committee to Fight Inflation, with Porter as its chair. As time progressed, the committee did not fare well, dropping the WIN campaign in March of 1975, and eventually changing its focus to energy. As the book winds down toward Ms. Porter’s death in 1991, one is saddened to see her depart. Ms. Lucht did an excellent job of bringing Ms. Porter into the reader’s life, sharing her successes and challenges, and enlightening us as to the role this woman played in the lives of many women who followed in her footsteps.